I’ve mentioned this fact before on this blog, and I will probably mention it again, but the North Star has never moved from it’s position relative to the Earth in the history of mankind, and it never will. It is always in the same spot in our sky from our perspective here on Earth. This fact alone, forgetting the massive number of other proofs and pieces of evidence, is a “case closed” observation: the Earth does not spin on an axis… it does not orbit around a Sun that is in “outer space”… our so-called “solar system” is not hurtling through “space” and orbiting around some other body, and the North Star (as well as every other star) is itself not hurtling through space and itself orbiting around something else. As far as I know, the official story to explain the North Star never moving is that the Earth is titled on its axis that that tilt is always pointed precisely at the North Star. Well, if this were true, it would mean that the North Star movements relative to the Earth would need to be in exact precision as the Earth moves around the Sun. So all of the heavenly bodies that are supposed spinning, orbiting and hurtling through space would need to move in such a way that the tilt of the Earth’s axis would always point directly at the North Star, which would give the appearance that the North Star does not move from our perspective on Earth. The implications of this are staggering. It means that we have been lied to on a massive scale by “science,” by governments, by space agencies, and in general by any group that uses this lie for its dark agenda. ← Why Does President Obama Keeps Mentioning the Flat Earth? Polaris doesn’t move? 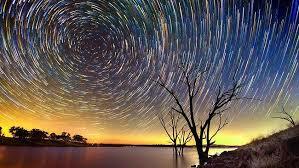 You can see Polaris move in a single night with a long exposure photograph. It is not perfectly aligned with the north pole, so it traverses a small circle throughout the night. A slightly larger circle is traversed in the opposite direction around Sigma Octantis in the southern hemisphere. And Polaris wasn’t always the northern pole star in recorded history. Pytheas in 320 BC described the absence of a northern pole star. Astronomers in the Roman Empire described Alpha Ursae Minoris (Polaris) and Beta Ursae Minoris as being equidistant from the celestial pole. The deviation of Polaris from the celestial pole is currently 0.75 degrees, but was measured as more than 3 degrees as late as the 16th century. The earth is indeed fixed, HOWEVER, it is NOT flat. There can be no such thing as north, east, south and west on a flat earth map which can make any sense. In an alleged flat earth, north must be the center and south must be the outer edge on all sides. Then what of east and west? The fact is, that no matter which direction one is going, (on a flat earth) he would be always moving south. Even if he were moving north, it would be ultimately south (at the same time moving north and south). For no matter which direction one were moving, he would necessarily be moving toward the edge of the earth which lies in all directions, which is south (in an alleged flat earth). The earth being an almost perfect sphere, is proven by centuries of mapping and voyages, and some of the most brilliant scientific minds in history went into discovering longitude and latitude used for navigation. This is NOT a deception, but something to appreciate. The earth’s size has thus been correctly measured. The terms “north, south, east and west” are used in the Bible and the Bible also teaches that the sun goes around the earth just as observed. The fact is that the sun rises and goes up to a zenith, and then goes down again, showing that the earth is spherical in shape. The sun does not go across the earth, which it would be doing if the earth were flat. This is visibly clear. The fact that the earth is fixed is proved or self-evident simply by the fact that the WIND BLOWS ACROSS THE EARTH. This is the simplest and clearest proof that the earth is fixed. For if the earth were rotating the atmosphere would be rotating with it in perfect synchronization, and clearly it is not doing so. The wind is moving above a still earth. And it moves even for thousands of miles in many directions and at differing speeds which also are not constant. The simplest deduction shows that earth is fixed. To more clearly see how the winds prove that the atmosphere is not in sync with an alleged rotating earth, see how far they travel OVER the earth. In the following links, you have AN ENORMOUS BODY OF AIR MOVING WEST 5,000 MILES, AND IN THE OPPOSITE DIRECTION OF THE ALLEGED ROTATING EARTH. THE ABOVE IS AN EXAMPLE OF THE ATMOSPHERE NOT IN SYNC OR NOT FOLLOWING THE ALLEGED ROTATING EARTH. JUST ONE CLEAR PIECE OF EVIDENCE THAT THE EARTH IS NOT ROTATING. How can anyone miss this simply proven fact, except by intense brainwashing and lack of consideration? What are those “things” we see above us, and how is their movement possible?